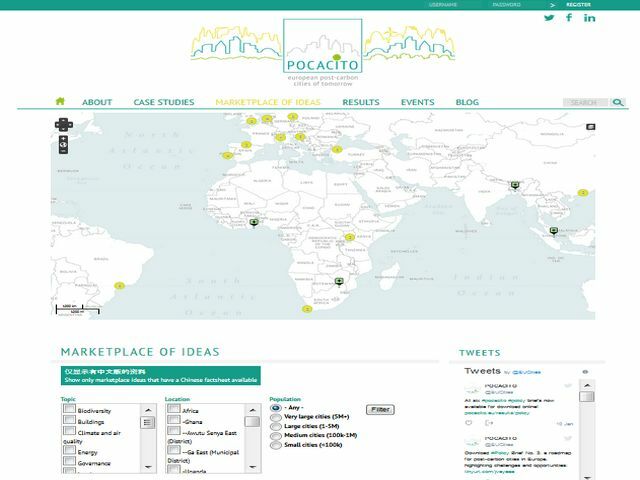 The Ecologic Institute is responsible for concept, design, programming and content of the POCACITO project website. The website offers an overview and detailed fact sheets about case studies and post-carbon cities. There is also a "marketplace of ideas", where users can search for specific information by filtering the topics, locations and population. An interactive map then shows the accompanying cities. Furthermore all news about the project can be found in the blog on the website. The website aims to be the central platform for collaborative writing. The internal area provides access to drafts, discussions and a list of all partners working on that project. The project "POst-CArbon CIties of TOmorrow – foresight for sustainable pathways towards lievable, affordable and prospering cities in a world context (POCACITO)" supports the transition of EU-Cities to a forecasted sustainable or "post-carbon" economic model, eventually leading to an evidence-based EU-2050 post-carbon city roadmap.